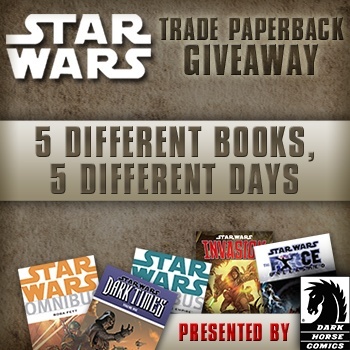 Dark Horse Comics is giving away five different Star Wars trade paperbacks to those who can answer a trivia question correctly. Strong with the force you are? Each day, we'll ask a random Star Wars question - just answer it correctly to enter the contest! The following day, we will choose a winner at random from those of you who answered the question correctly. You only get one shot at the question, so brush up on your Star Wars knowledge. For a full list of the rules and prizes, please click here. Please note, you must be at least 13 years old and currently residing in the US or Canada to participate.